In this Competition we had two Persons who sent us exactly 19 Photos - Fine Artists Dana from Germany and Dražen from Croatia! Two of three International Jury Members (scroll down) found Dražen's Photo (here bellow) as best one! That means, Dražen won two overnight stays (4.-6.12.2013) in one well known Hotel in Vaduz, Liechtenstein. Please check HERE which hotel is it? We are thankful to Dana and Dražen very, very much for theirs great actions! We are thankful very much also to our Sponsor and all Jury Members! 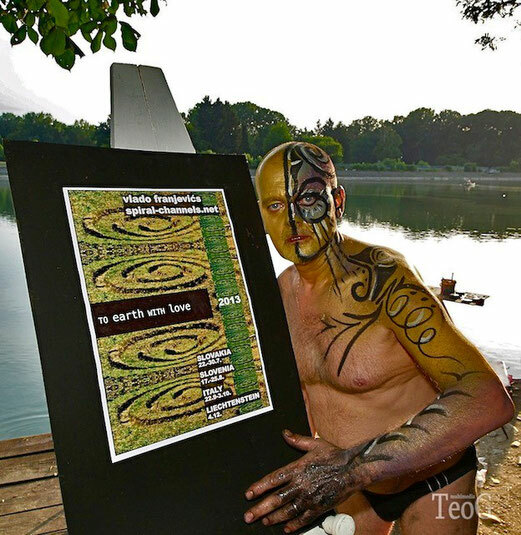 "Pavlović’s photo with a body painted man and a river behind, is very impressive. It evokes the verse on the poster talking about the earth we love. It's just excellent! By just seeing it, everybody feels as a native. So I vote for this photo!" Beitrag von vlado franjevic - all around artist. "The best Photo of the SPIRAL CHANNELS POSTER"! MARIJAN GRAKALIĆ was born 1957. It is obvious that he’s deep marked with the growing up in the house of his father, also a writer and poet. Marijan studied at the University of Zagreb, and was one of the founders of the journal ''Zoon Politikon'' (1978). In his literature he use different genres and is very much interested in theoretical investigation of alternative movements or lyrically poetic expression. He wrote in the best known newspapers and magazines from eighties. From 1989 to 1993 he was the editor of the independent monthly journal ''Azur“ and the eponymous publishing house, where he as editor signed up many numbers of publications of different authors and publicists. A short time he was director of publisher „Mladost d.o.o.“ Today he lives in Zagreb as an independent and well known writer and freelance artist and leads following portal „Radio Gornji Grad“. SUDHIR SHARMA is the founder of Indi Design based in India, he is developing Indi into a multinational network of designers and associates to use design expertise into the service of Society and Business. The network has 5 international offices and 7 offices in India. Sudhir has over 24 years of experience working in design in India. Founder and president of “Design India” ( India’s largest social community of professional designers) and Chief Editor of the POOL Magazine (for Design, Innovation and Art), Sudhir is an alumnus of the World Economic Forum’s World Design Council, was on the inaugural design jury at the 2008 Cannes Lions Festival, and Adfest 2009, Jury on the Dutch Design Awards 2011 and 2012, “Design Turkey” and has been involved in successful and award-winning transformation of many household brands in India. Entrepreneur of the Year” 2009 for his contributions in India’s design business industry. Sudhir passionately believes that design thinking can alter the fortunes of organisations and economy of a country. Brands need to simplify their pitch to the consumer and coordinate the experience with the content that they offer. Simple, straight-forward execution of a complex strategy, is an easy way to enter the heartsof the consumer in these chaotic times. Sudhir resides in India but travels extensively in Asia and Europe. Shortly he has returned from being a Juror on spikes.asia awards in Singapore. WILLIAM ANDERSEN is an artist and an educator. He has exhibited his artwork throughout the United States and internationally in China, Korea, Japan, Taiwan, Malaysia, Kuwait and Dubai. He has received numerous honors and awards including a Fulbright-Hays Fellowship and the Mary Nohl Fellowship for Individual Artists. Andersen’s work has been shown in the Wisconsin Triennial and Wisconsin Artists Biennial and in such places as the Museum of Modern Art Kuwait, the Madison Museum of Contemporary Art, INOVA, and the Milwaukee Art Museum. His artwork has been collected by members of the royal families of Saudi Arabia and Kuwait as well as is included in numerous public and private collections in Austria, the UAE, Kuwait, Saudi Arabia, Japan, Malaysia, Taiwan, Korea and the US. William Andersen is currently an Assistant Professor of Studio Art and Graphic Design at the American University of Kuwait (AUK). Prior to his appointment at AUK, he was a Visiting Assistant Professor at Beloit College and a Senior Lecturer at the University of Wisconsin-Milwaukee. Andersen received an MFA from the School of the Art Institute of Chicago after receiving a BFA in Painting & Drawing and a Cross-School Major in Art History & Criticism from the University of Wisconsin-Milwaukee. He was awarded a Fulbright-Hays Fellowship to research Chinese art and culture in Taiwan and China before moving to Kuwait in 2008. His artwork and point have been primarily influenced by his travels between the US and Asia over the last eighteen years. During this time, he has watched as regions like the Middle East and Eastern Asia have emerged as economic and cultural forces and is fascinated by the tightening global web of economics, resource use, migration, and cultural hybridization. Because of this, the notions of globalization and hybridity are the central focus of his current artistic practice. Using a hybrid of traditional and new media approaches, his artwork often incorporates chinoiserie imagery, an interest acquired early on amid his mother’s collection of blue and white china.